The exhibit is comprised of 20 "sun boxes." 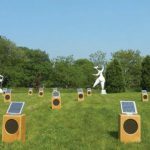 Each one cradles a speaker, solar panel, and PC board strumming a continuously looped guitar note. A slew of musicians are performing this holiday weekend at venues around the Vineyard. The Times recently sat down and asked DJ DI what she does to remain inspired and keep things fresh for her Martha's Vineyard audience. Gathered in sunny Chilmark last Saturday afternoon spilled a crowd of more than 50 for Water, a show curated by Melissa Breese. October 30, is Devil's Night, the common name given to the night before Halloween, but one can celebrate it this year without causing too much trouble. Everett Whiting of West Tisbury and Tim Laursen of Vineyard Haven joined efforts this summer to bring us Local Smoke. 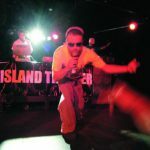 After dark on Friday, Nectar's boasted an enthusiastic crowd of dancers, anticipating Supernova Fieldtrip, the Island's newest hip hop group, composed of three Island men. 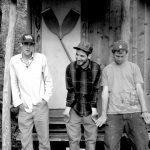 Island Thunder is a group of Island guys who produce, mix, remix, and hype the music scene on Martha's Vineyard. 025 sits comfortably together as laughter filters from one another this past Sunday morning. Late Sunday afternoon brought windy weather and the sounds of bleating sheep outside Dukes County Love Affair's studio in Lambert's Cove. 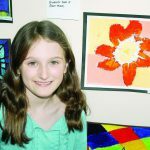 Cynthia Wayman has been teaching children of all ages at her Lambert's Cove studio for more than 30 years.